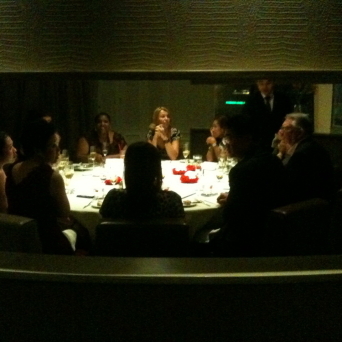 I’d never even heard of a champagne dinner let alone work through one until last night. The Dusit Thani Bangkok’s Trudy Cook treated a handful of invited guests to a fabulous evening at D’Sens restaurant with the main focus being Billecart-Salmon champagnes. Perched on the 21st floor of the Dusit’s flagship property in downtown Bangkok, D’Sens offers sweeping panoramic views of Lumphini Park and and served as the perfect venue to learn about fine champagne, sip and eat. As a co-founder of Smiling Albino I’m always checking out new places and trying to keep my fingers on the pulse of the areas we operate in and this was a perfect opportunity to expand the pulse. We were seated at a private round table, full of champagne glasses, a custom menu and the bubbly quickly started flowing. We started with Billecart-Salmon Reserve which tasted nice, but like a typical upper-market champagne. I managed to get down a couple glasses along with the Saumon Fume served with to-die-for bread. Next came Billecart-Salmon Rose which was quite interesting and tasty. Just a bit sweeter than the first bottle of Reserve, it was a bit softer and really hit the spot (or perhaps it was just the fact I was now on my third glass). They paired this with a crayfish and smoked salmon duo with green asparagus coulis which was very satisfying and left me wanting a bit more. With my bowl empty I opted for another glass of Rose instead. 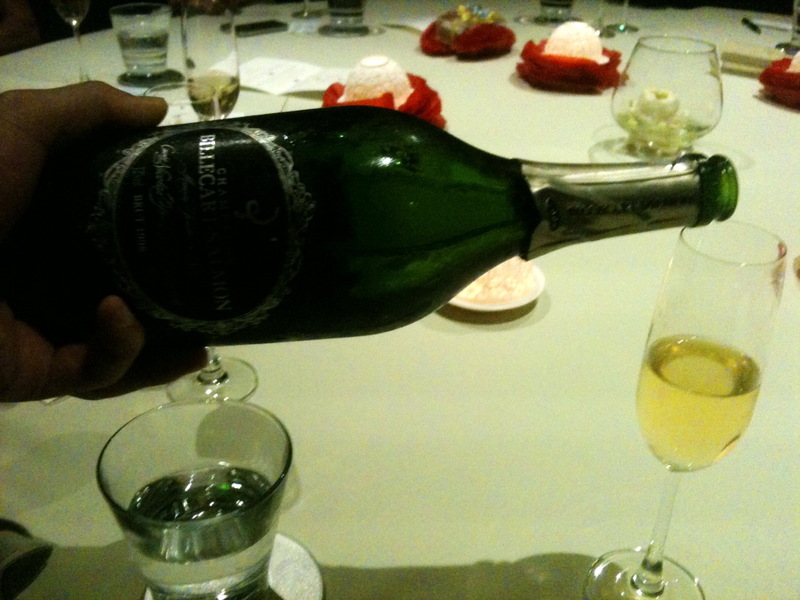 Bring on my favorite of the evening: the gorgeous Billecart-Salmon Brut Vintage 2004. I won’t pretend to know my champagnes but this one was the tastiest I’ve ever had. Very dry, crisp and delicious, it went down smooth and quickly. Pretty sure I had about three glasses and good thing as word circulated that it usually sells for a bit over 10,000THB ($350US) per bottle. Steamed cod fish with espellette pepper, eggplant and caviar went so-so with the Brut, but then again with this bottle I think few people were focused on the food. Our fourth and final bottle was the best according to the resident expert, Billecart-Salmon Cuvee Nicolas Francois Billecart 1998. Again this one was very crisp, light and dry, but by this point I can’t truthfully say if I liked it more than the Vintage. To be sure I had two glasses. Quail in a glazed red wine reduction complimented this pour very nicely and I only wish there had been a larger piece of this tasty bird. A small raspberry/champagne desert rounded-out the evening, a top-up for a final glass and one guest treated us to two acapella songs songs which she belted out like a pro. Oh hang on, she is a professional singer (must be that champagne clouding my memory). D’Sens is a very nice room worthy of a visit with someone special to gaze at the sprawling city, soak in the relaxed cool vibe and of course tap a bottle of bubbly and snack on tasty French treats. Thanks to Trudy and the Dusit’s team for a very nice evening.